As ubiquitous in hospitals as stethoscopes, the Oxford Handbook of Clinical Medicine is a guiding star for all medical students, junior doctors and trainees. The culmination of more than 20 years' clinical experience, and containing the knowledge and insight gained by more than 15 authors, the new eighth edition continues to be the definitive pocket-sized guide to today's clinical medicine. Packed with clear, clinical management advice which is practical to implement at the bed-side, the Oxford Handbook of Clinical Medicine is written in a clear and didactic style. With witty, esoteric asides linking medicine to everything from the classics to popular culture, all the material is presented in a way that is instantly memorable and even easier to put into practice. With extensive improvements based on reader feedback, the new eighth edition boasts even more black and white and full-colour images, which are now larger to improve their clarity and ease-of-use. Mindful of how doctors' training is constantly evolving, a new chapter on 'history and examination' explores this relevant critical skill in depth, enabling you to elicit as much information from the patient as possible. An expanded radiology chapters features improved images, and new topics are devoted to new cancers such as nosocomial infections, and further common surgical procedures. The references have been thoroughly overhauled with 'key references' identifying the best places to start when researching the subject, and all references are fully accessible via the supporting website. Following the familiar, easy–to–use at a Glance format, OSCEs at a Glance 2nd Edition is both a revision guide and a comprehensive introduction to objective structured clinical examinations for medical students. Fully revised to suit the current curriculum, and written with student feedback and experiences in mind, this full–colour textbook contains brand new and comprehensively indexed chapters which include 32 new OSCE stations, covering distinct areas of specialisation as well as broader practical and communication skills covered in the exams. This new edition of OSCEs at a Glance is also supported by a companion website at www.ataglanceseries.com/osces containing downloadable OSCE checklists – perfect for testing knowledge in the run–up to exams. Step-Up to Medicine is your lifeline for the clinical years of medical school. This book was originally written by third-year medical students searching for the perfect review book—not finding it on the market, they wrote it themselves! Now in its third edition, Step-Up to Medicineboils down the full scope of tested pathology in a single ingenious tool. Each element is tailored for immediate content absorption, and an all-new, full-color interior differentiate elements for even faster, more efficient review. And, Step-Up to Medicine, third edition provides twotypes of self-assessment—the kinds of questions you will ask yourself as a clinician plus USMLE-style practice questions. This review book gives you just the Step-Up to the medicine clerkship, accompanying shelf exams, and USMLE Step 2 that you need! Full-color, updated interior design brings the content to you in a rousing, memorable style. Full-color, updated art program illustrates concepts when a picture says it best—plenty of clinical images also supplement topics. New content on evidence-based medicine keeps you current and informed to guide your clinical decision making. Expanded content on drug dosing is added where relevant. eBook with the fully searchable text is available via thePoint . Clinical examinations in the OSCE style of marked stations are daunting for all students, whether undergraduates or MRCP candidates. The recent introduction of the 5-station PACES (Progressive Assessment of Clinical Examination Skills) exam inspired a great deal of apprehension, so the appearance of the first edition of Hall’s PACES for MRCP was greatly welcomed by candidates and became an immediate success. This new edition builds on the book’s reputation. It provides, in one colourful and attractive volume, complete coverage of all the most common medical cases that will be covered in PACES and similar exams. Although designed specifically for the PACES part of the MRCP exam, its in-depth coverage means that it can be used by any student preparing for clinical examinations in medicine. This new edition of An Aid to the MRCP Paces Volume 1: Stations 1 and 3 has been fully revised and updated, and reflects feedback from PACES candidates as to which cases frequently appear in each station. An Aid to the MRCP PACES Volume 3: Station 5 is a brand new, fully updated edition of the best-selling PACES revision guide to address the newest Station, covering Integrated Clinical Assessment, with content guided by the experiences of PACES candidates. Fully updated with the latest clinical data, including specially commissioned research, this new edition of Clinical Examinationaddresses the core principles and clinical skills that underpin diagnosis for safe, effective medical practice. Clinical Examination: A systematic guide to physical diagnosis, 7thedition breaks down each body system into a logical framework focusing on the history, clinical examination and correlation between physical signs and disease for each system. Helping students navigate from first impressions though to the end of consultation, the text provides a patient-centric, evidence-based approach, making it the definitive resource for anyone embarking upon a medical career. This classic textbook sets out clearly and concisely how to evaluate symptoms and elicit relevant physical signs. It describes the practical skills which every clinician must acquire and develop in order to evolve diagnostic procedures and management strategies and plans. 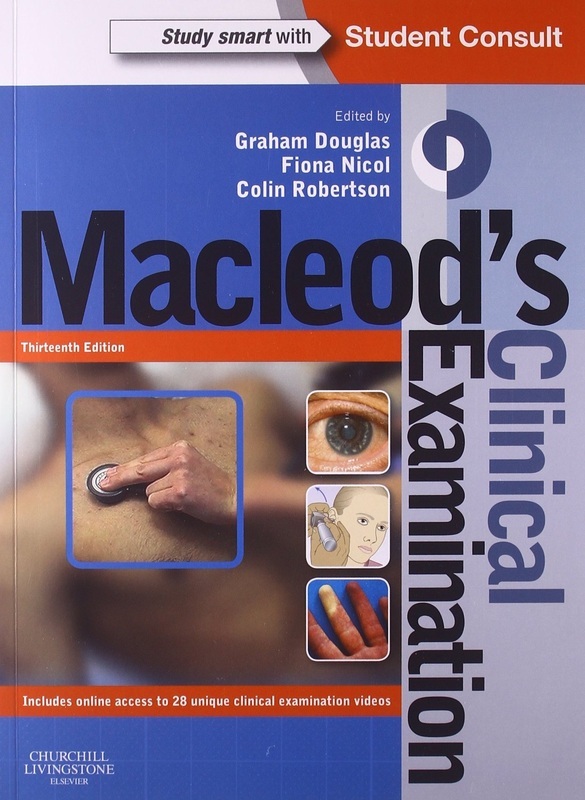 ‘Highly Commended’ in the 2006 and 2010 BMA Medical Book Competitions, this Thirteenth Edition contains over 500 clinical photographs and diagrams to illustrate the text, with new topics added to make the book even more comprehensive. System examination covering symptoms and signs. Included on the Student Consult site are the specially-recorded videos demonstrating many of the clinical examination routines described in the main text. New chapter on palliative medicine. Five times the number of margin clinical photos. Double the number of dermatological images; including all the major lesion morphologies covered in a single page. New sections on protein synthesis, energy production and stem cells. New members of the International Advisory Board from India, South Africa, Poland and the Middle East. 7 new online chapters from the International Advisory Board. 30 extra short chapters online, written by members of the International Advisory Board to cover key international issues, such as malaria, envenoming and HIV. Animated practical procedures, including lumbar puncture, central venous and bladder catheterization, arterial cannulation etc. interactive surface anatomy available online. One-year's online access to the new edition of Goldman's Cecil Medicine - 2704 more pages of definitive medical reference. Full text and downloadable images online through StudentConsult. Add your own notes and bookmarks. Search across all the StudentConsult resources you own online in one place. Davidson's global perspective is enhanced by the input of an international team of authors and a distinguished International Advisory Board from 17 countries. Building on the foundations laid down by its original editor, Davidson's remains one of the world's leading and most respected textbooks of medicine. The underlying principles of medicine are described concisely in the first part of the book, and the detailed practice of medicine within each sub-specialty is described in later system-based chapters. Most chapters begin with a two-page overview of the important elements of the clinical examination, including a manikin to illustrate the key steps in the examination of the relevant system. A practical, problem-based clinical approach is described in the 'Presenting Problems' sections, to complement the detailed descriptions of each disease. 1350 text boxes present information in a way suitable for revision, including 150 clinical evidence boxes summarising the results of systematic reviews and randomised controlled trials and 65 'In Old Age' boxes highlighting important aspects of medical practice in the older population. A combined index and glossary of medical acronyms contains over 10 000 subject entries. The contents can also be searched comprehensively as part of the online access to the whole book on the StudentConsult platform. Access over 500 self-testing questions with answers linked to the book's content for further reading. The text uses both SI and non-SI units to make it suitable for readers throughout the globe. A new chapter specifically on Stroke Disease recognises the emergence of Stroke Medicine as a distinct clinical and academic discipline. A rationalisation of the 1350 boxes used throughout the book gives a simpler and clearer presentation of the various categories. New 'In Adolescence' boxes recognise the fact that many chronic disorders begin in childhood and become the responsibility of physicians practising adult medicine. These boxes acknowledge the overlap 'transitional' phase and highlight the key points of importance when looking after young people. The regular introduction of new authors and editors maintains the freshness of each new edition. On this occasion Dr Ian Penman has joined the editorial team and 18 new authors bring new experience and ideas to the content and presentation of the textbook. An expanded International Advisory Board of 38 members includes new members from several different countries.